Cars! Cars! Cars! Editorial Staff Hired As Ford CEO! - Cars! Cars! Cars! Cars! Cars! Cars! Editorial Staff Hired As Ford CEO! Or we friggin' wish. Check it, yo: The Detroit News reports: Ford ups CEO bonus. Ford Motor Co. said Wednesday its board of directors approved a $6 million stock option bonus -- $1 million more than was previously promised -- for new CEO Alan Mulally. Aw, yeah, boyeee! Nothing changes except good ol' Alan's pocketbook (it's European!). OK, OK, if we can't be CEO, can we at least be a senior exec like pretty boy Fields? The board also approved cash payments to other senior executives to compensate them for a bonus program the company is scrapping in favor of a new compensation plan, according to documents filed with Securities and Exchange Commission late Wednesday. Hey, that's good news, folks. Why? Because if bonuses are being handed out that means that the company is turning it around!! Woohoo! The news of the payouts came as thousands of salaried workers who signed up for buyouts or early retirement packages bid tearful farewells to their friends and colleagues. It also follows close on the heels of the record $12.7 billion loss the automaker posted for 2006. Aw, hell, it ain't just bonus time, it's Miller time! Suds it up, boys! Make sure to read the article -- it's simply chock-full of tasty quotes like this: "What's a million? Plus or minus a million dollars is not going to determine whether Ford succeeds or fails," analyst Bradley Rubin of BNP Paribas said. 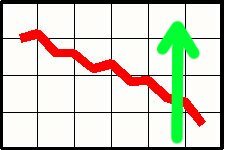 That expert graph shows Ford Sales (red) vs Mulally's pay (green, baby, green).